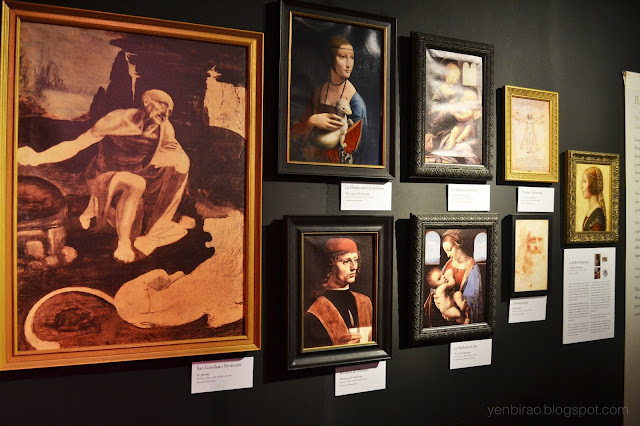 Last August 28, I was invited to attend the exclusive instameet preview of Da Vinci - The Genius in The Mind Museum at Taguig. My Instagram followers must have noticed how much I enjoyed instagramming the works of Leonardo da Vinci (sorry for flooding your IG feeds, guys! I know you loved it, too! Haha). There's a reason behind it which I will share to you on my next posts. For now, I would just like to tell you more about the details on this exhibit and why you should not, for the love of God, dare miss this thing! I included some of the photos I was able to snap during the event, hoping it would make you realize how awesome this exhibit is. Haha The pictures are not that good though, (not a photographer. sorry! :P) but believe me, there is more to it than meets the eye! So, read on and be amazed! "Da Vinci - The Genius", the most comprehensive exploration of Leonardo da Vinci's work, is now in the country for a limited time only. From September 1 to November 30, the premium traveling exhibition created by world renowned Grande Exhibitions Australia can be experienced in The Mind Museum at Taguig. Da Vinci - The Genius celebrates one of the most revered and dynamic minds of all time. Created with the assistance of Leonardo da Vinci experts in Italy and France and crafted by Italian artisans, only "Da Vinci - The Genius" has been in the most prestigious museums in 51 cities all over the world. The exhibit features over 200 pieces of Leonardo da Vinci's extraordinary works from paintings, war machines, flying machines, to his codices, leaving one inspired and in awe of what one human being can do with the power of his mind. The interactive experience will immerse guests in Da Vinci's timeless brilliance through full-scale interpretations of the masterminds' inventions and unparalleled studies of his iconic art. The exhibition features 13 compelling themed areas of Da Vinci's work, offering visitors an unmatched look inside the mind of the ultimate Renaissance man who laid the groundwork for some of modern society's most impactful inventions, such as the helicopter, airplane, automobile, submarine, parachute and bicycle. The Mind Museum aims to give their guests an extraordinary experience that inspires them to understand nature. Visitors to Da Vinci - The Genius are invited to embrace the history, theory and objective behind each of Da Vinci's designs and artworks through engaging and entertaining technologies. Many exhibits are interactive and could be pushed, pulled and touched for better understanding. Other highlights include reproductions of "Virgin of the Rocks", "The Annunciation", the controversial new Leonardo discovery "Bella Principessa", amazing anatomical sketches, the preparatory drawings of the "Anghiari Battle", and video presentations of "The Last Supper", the "Vitruvian Man", and the "Sforza Horse" sculpture that offer never before seen perspectives on these famous works. Guests will also enjoy a glimpse into da Vinci's mysterious alphabet and writing techniques as they browse touch-screen versions of his actual codices. Da Vinci - The Genius was developed by Grande Exhibitions Australia, under the kind auspices of the Commune di Roma, Commune di Firenze and Citta di Venezia. This once in a lifetime encounter with the greatest genius of all time is made possible by The Mind Museum, the Philippines' first world-class science museum. Da Vinci - The Genius will be open on Tuesdays thru Sundays. For more information on tickets and schedules, visit www.themindmuseum.org.